This is a simple, creamy and decadent coconut dip with no heating or cooking involved. All ingredients for this will be available at your local grocery store. Coconut cream is the main ingredient in this dip. 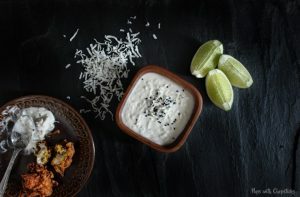 It is much thicker than coconut milk and usually has the consistency of soften butter in room temperature which makes it a fantastic ingredient for easy and flavourful dips! Too Thick? or Not Thick Enough? 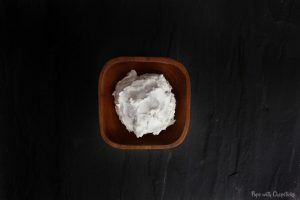 Depending on the brand of coconut cream you buy, they sometimes come very thick – almost paste like. Thin it out to your preference by adding milk in it. If the dip is not thick enough or you added too much liquid, I find adding desiccated unsweetened coconut flakes thickens it up quite nicely again. 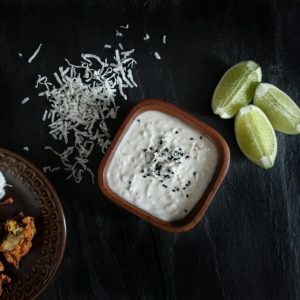 A simple coconut dip that is made with coconut cream, lime and garlic to give it the full bodied creaminess and coconut flavour. [Optional] Adding 1/2 tsp of onion seeds adds a bit more spice and flavour to the dip. Serious yum! Salty, sour, sweet coconut. I’m thinking I will try this with Indian fritters and popadom. Any other suggestions? I did it with chips. Not sure it was that tasty with chips haha but definitely good with fried chicken and fritters! I even scooped some into my pasta sauces! 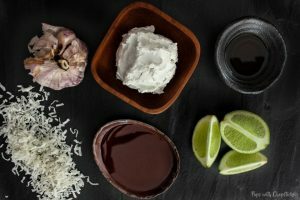 The coconut cream melts into a oil and gives it a nice flavour! i’m not a huge fan of plain chicken, but if i had this sauce to serve it with, i’d eat it alllll day long. also thinking about how good this would be with sauteed veggies, a hard-boiled egg and some rice. mmm. 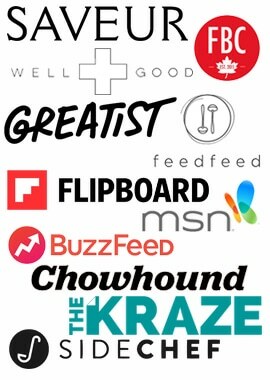 delicious recipes . thanks alot. i will must try this dip.